Jim Parsons’ laid-back Texas charm goes a long way towards mitigating the irreverent elements of David Javerbaum’s amiable take on the Almighty. 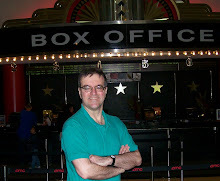 Javerbaum’s a multiple Emmy winner for “The Daily Show with Jon Stewart” of which he was head writer and executive producer. Not so terribly different in its essentials than various Hollywood God portrayals (think George Burns, Morgan Freeman, etc. ), though this God admits to “wrath management issues,” we have here the Deity coming to Broadway in the human form of the “winning,likeable personality” of the Emmy-winning sitcom star making the conceit more palatable for audiences who might otherwise take offense at the sometimes blasphemous elements. “Your apprehension of My depthless profundities will be aided by his offbeat charm,” God/Parsons informs us, and indeed it does. Still, with riffs about the Creation with Adam and Steve, and a new set of Ten Commandments (like ““Thou shalt not tell others whom to fornicate” and “Thou shalt separate Me and state,” there’s plenty to raise the hackles of devout folk who feel that humor and religion shouldn't mix. 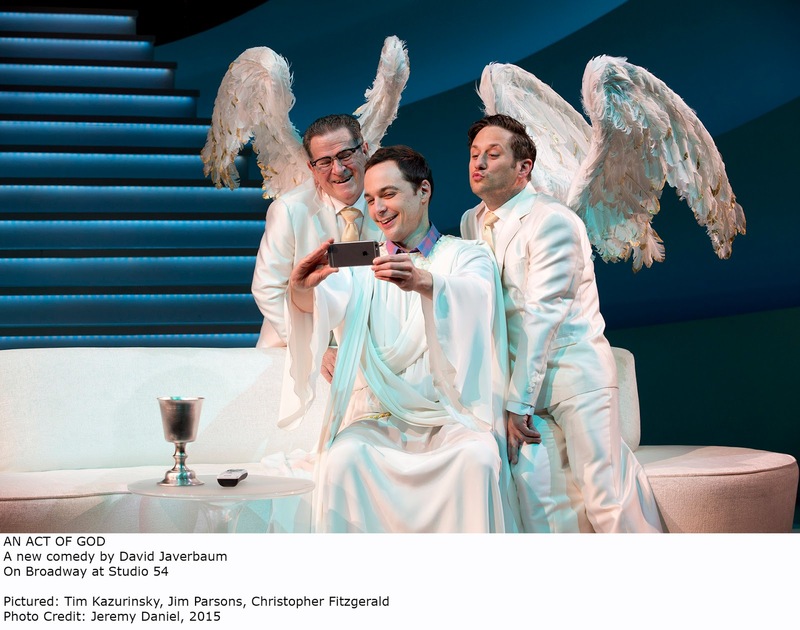 With a spacious set and a stairway to the stars by Scott Pask in that former den of iniquity, Studio 54, “a venue that’s…resonant with celebrity misadventure,” God/Parsons holds forth on a white sofa, bedecked in a white robe (courtesy of designer David Zinn) assisted by Tim Kazurinksy as Gabriel holding a Gutenberg bible on stage right, and a contentious Michael, played by Christopher Fitzgerald, on the left, providing feisty feedback, taking planted questions from the audience, and throwing in a few of his own, too (“Lord, do you answer prayers?”), much to God/Parsons’ annoyance. Along the way, He touches on Creation (which took about five hours, as "there was darkness over the face of everything"), Evolution, the Nativity, and the Crucifixion. The “play,” based on Javerbaum’s “The Last Testament: A Memoir By God,” and his Twitter account @TheTweetOfGod, hardly merits that descriptor as it’s really just a featherweight, 90-minute comedy sketch. Still, in its often clever way, it tackles some big questions. Why does God allow bad things like the Holocaust to happen to good people? Why is there something as opposed to nothing? Why is there suffering and injustice? Joe Mantello’s direction keeps things moving at a breezy pace, though by the end of the intermission-less evening, the show can seem a bit wearying. We’ve heard some of these jokes before, even though the script is rife with topical references: Sarah Palin, Donald Trump, the Kardashians and Patti LuPone are all humorously mentioned at one time or other. I wouldn’t say the evening is a laugh riot, but it’s amusing enough, and along with the gags, there’s occasionally some genuine food for thought. Above all, though, after stellar turns in “Harvey” and “The Normal Heart,” Parsons once again impressively affirms his solid chops as a stage actor.